44 LATTR� / BONNE, R. Partie de l'Amerique Septentrionale. . . Canada, la Louisiane, le Labrador, le Groenland, la Nouvelle Angleterre, la Floride� [Canada 1re. Feuille et Canada 2e. Feuille]. Paris, 1776. Limites en col. ancien. Carte en 2 feuilles. - In 2 sheets. Some discolouration along centre fold, in good condition. Orig. outline col. 300 x 435 mm. Second state, with "Theatre de la Guerre en Amerique". Interesting map of the eastern part of Canada with Hudson Bay, Baffin Bay, Greenland and with New England, Louisiana and Florida. 45 CURRIER & IVES. 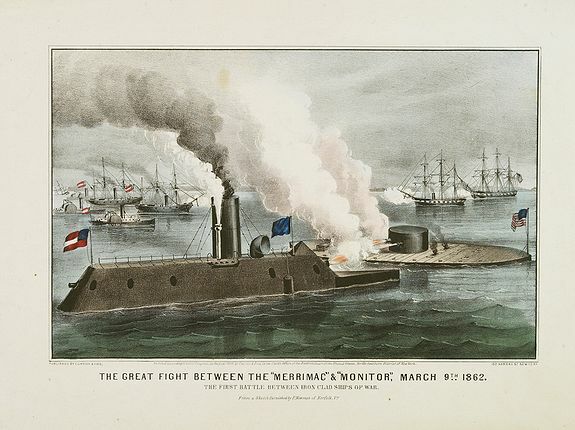 The Great Fight Between The "Merrimac" & "Monitor", March 9th 1862. New-York, 1862. Col. ancien. Lithographie en coloris d'�poque. Dimensions de la feuille : 340 x 457 mm. - Lithograph orig. col. by hand. 207 x 320 mm. � The first battle between iron clad ships of war. "From a sketch furnished by F. Newman of Norfolk, Va.", depicting the action between Monitor and CSS Virginia. 46 WILLIAMS, H.T. The Pacific Tourist. 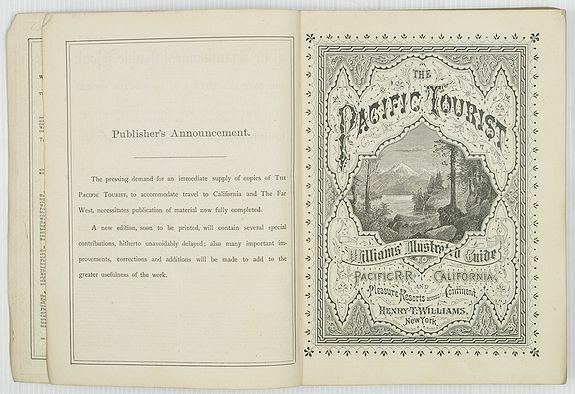 Williams' Illustrated Trans-Continental Guide of Travel, from the Atlantic to the Pacific Ocean. New-York, 1876. In-8 comprenant une carte photo-lithographi�e : "Williams' New Trans-Continental Map of the Pacific R.R...". - 8vo. With orig. col. photo-lithographed folding map. Publisher's gilt-lettered cloth, some fading to backstrip. 2 large tears at upper and lower left corner..
� With folding map: "Williams' New Trans-Continental Map of the Pacific R.R. and Routes of Overland Travel to Colorado, Nebraska, the Black Hills, Utah, Idaho, Nevada, Montana, California and the Pacific Coast". 47 JEFFERYS, T. A New Chart of the Coast of New England, Nova Scotia New France or Canada, with the Islands of Newfoundld. Cape Breton St. John's &c. Londres, 1746. Papier jauni, coup�e le long du filet d'encadrement. - Paper slightly age-toned as usual, trimmed to neatline, repair of split upper part right 7 cm into engraved area. 345 x 465 mm. Done from the Original Published in 1744 at Paris, by Monsr. N. Bellin.